Up until a few months ago, a mention of Olympic Games would have entailed a spirited discussion about the performances of Indian players and the support they need, the freakily high medal tallies of some countries, Nadia Comăneci (my first memory of all things Olympics), a goose bump inducing video titled ‘Freedom Run’ played on the national television back in the 1980s-90s and the Olympic Torch Lighting Ceremony, not necessarily in the particular order. Mention Olympics Games now and I will spend a healthy few minutes talking about the spectacular Panathenaic Stadium in Athens. The gleaming marble of the stadium, the podium for winners and the Olympic Games symbol etched on the ground, the atmosphere here is one of passion – the passion to achieve, to succeed and win! By the way, did you check out the opening ceremony of the 2017 Winter Olympics? Oh and the figure skating and skeleton. Absolute favourites! Why is this multi-purpose stadium so important? Because it is the site where the great-great-great and several more great granddaddies of the modern Olympic Games took place. These games were the Panathenaic Games held once in every four years. Sound familiar? To facilitate the games and other events, a wealthy Greek built a race course between two hills. This was sometime in 6th century BC. Presumably with the intention of making the stadium better equipped, the Roman senator Herodes Atticus had the racecourse rebuilt into a stadium with marble seats that could hold around over 50,000. As history unfolded, the stadium fell into disrepair and was buried under the sands of time until 1860 when it was excavated and spruced up to host a version of the Olympic Games. These were the Zappas Olympics, an attempt to revive the ancient Games by Greek businessman Evangelis Zappas. The stadium, meanwhile, was commissioned to be redesigned and rebuilt in Pentelic marble – the rebuilding was to be done on the basis of the original structure based on records from ancient texts. This was then thrown open to the public in 1896. Since then, the Panathenaic Stadium has been used for several games with international participation, including the 2004 Summer Olympics in Athens. History lessons aside, there is a simplicity to the structure of this historical that, in my sister’s words, “adds grandiose to the simple splendour of marbles”. The Panathenaic stadium is easily accessible, at the corner of a busy intersection yet rather quite inside. Come to think of it, the stadium was actually one of the least crowded among all the places we visited during our trip. Wonder why? Entry to the stadium is by ticket, along with an audio guide that you absolutely MUST take. The track seemed pretty well maintained to my lay eyes, a sportsperson would know better. But it was good enough for me – and a handful of others – to jog or run on. Even if you don’t fancy a run under the sun, do walk a lap. Then you can boast of having walked in an Olympic stadium. My sister wanted me to try a running video but that isn’t my cup of tea. 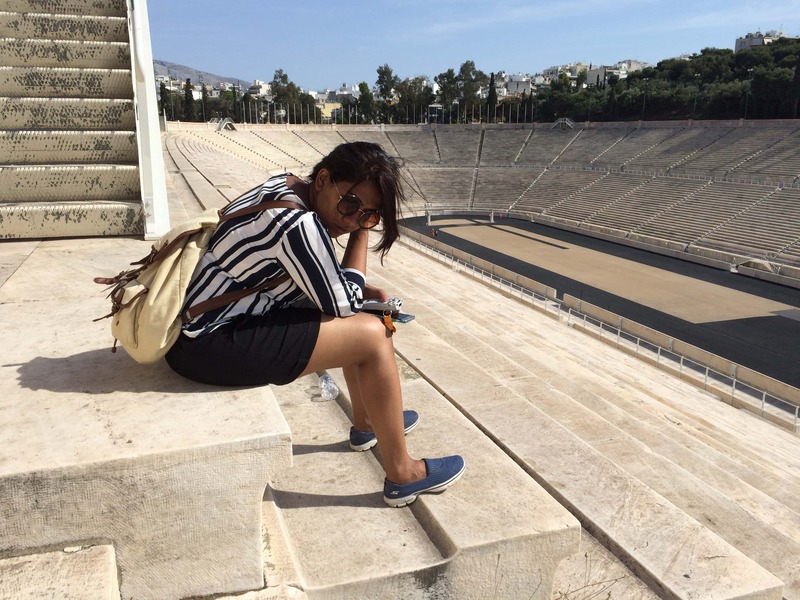 Take a deep breath and a few gulps of water if needed as you make your way to the highest seats – the view of the stadium from these seats is stunning as is the panoramic view of Athens with the Acropolis at a distance. One of the highlights of the stadium is the athlete’s tunnel and the small exhibition in a room upstairs. Kudos to the person who has written the content for the audio guide and the narrator – the balance of information delivered in controlled expressive voice, the audio guide walks you through the history of this massive structure, including the story behind the two marble seats, the water spouts, the athletes’ tunnel, the winners’ stand. As you walk through the tunnel, you can almost see the athletes stomp by you, their muscles and mind geared up to win the battle in the stadium. The exhibit room is a revelation. With torches from the first Olympic Games to the latest, along with the posters of each on display, one cannot help but appreciate the effort taken in collating this collection. Take some time to admire each poster, they are a delight especially for artists and designers – each print is a reflection of the era in which it was made, be it the colour palate, the fonts and the design. I found a preference for the older ones rather than recent. Up front and centre are replicas of the concave mirror and the altar used for the traditional Olympic Torch Lighting Ceremony. I think between the three of us – my sister, brother in law and I – we could have easily spent another 30 minutes or more just sitting around, soaking the atmosphere but we were in a rush to return to the apartment to pick up our luggage and head to the airport. That was the last bit of our trip to Athens but definitely not the last you will be reading about Athens on this blog. Some more about the adventures of the trio in Athens coming up next week, till then happy reading and happy week.